Find more information on Quizlet and other platforms in the post Making the Most of Assessment Digitally. While I had previously thought of Quizlet as the best digital flashcard site around (and it is), they have recently added a number of features for learning and assessing content that have made it even more valuable. So here is a brief update on their new offerings as well as an overview of all of the ways you can use it. As I said Quizlet is a great site for creating multimedia study cards with several built-in accessibility features like built-in text-to-speech, keyboard shortcuts, and auto play. You can favorite particularly tricky terms or Quizlet will automatically mark the cards that give you the most difficulty. In addition to learning the material through the flashcard and learn areas, students can test their skills by writing missing terms, or taking a quiz made up of a mix of matching, writing, multiple choice, and true/false responses. It gives students and teachers a number of ways to approach knowledge acquisition. Last year they added a number of game-based learning options including a matching exercise and a fun gravity game that requires you to put in the correct terms before asteroids hit the planet. There is also Quizlet Live (requires 4+ students) where students will answer questions from their own devices in teams. It’s different from other game-based assessments because it requires group communication since only one teammate may have the correct answer. The teacher can track a leaderboard for student progress and can then engage in a review. Just like with every other exercise, all students data is tracked automatically. It’s easy to get content. You can search for through the wide selection of available sets. There are even several sets created by content partners like EverFi, Pearson, or MCAT. You can also just create your own manually or by importing info from spreadsheets. 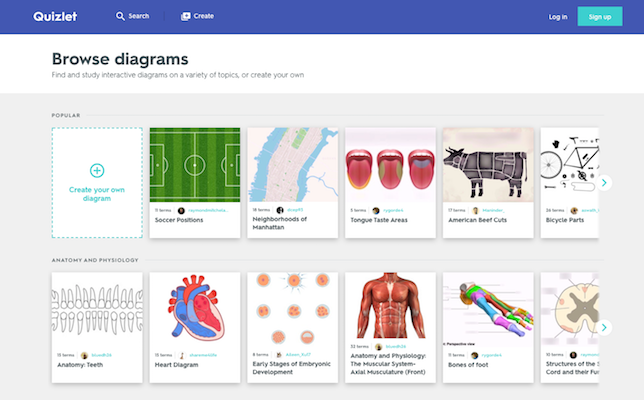 They now also have Quizlet Diagrams which help students visualize their study material and review material in a new way. You can label spots or whole sections on any image you’ve imported. A lot of Quizlet’s features are free, but they offer two fairly inexpensive pay models. The Plus plan allows you to add images, record enhanced audio, organize classes, and more for only $20 per year. The Teacher plan gives even more ways to track your students along with the other features for $3 per month. Those are fairly teacher-friendly prices. There are even group deals available. Many of Quizlet’s latest features are small ways to help make you more efficient. Teacher Guide: Now they have videos and handouts to help teachers get started or share what they’ve learned with colleagues, students, or parents without having to create it themsleves. The student/parent handouts even assure families that QUizlet is COPPA compliant. Auto-Suggestions: You can create sets more quickly as the AI helps auto fill both terms and definitions. You may never have to write or copy a definition again. I found it to be very intuitive. It’s based on sets created by others which means you may get an occasionally crazy suggestion, but it also means it will keep getting better. Google Auto Sign-In: Any time I don’t have to remember another login I am happy. Students will also be automatically linked with their Google logins to Quizlet. This makes it a breeze for G-Suite schools. Flexible Grading: Quizlet is now smart enough to allow for multiple correct answers. If two different terms are both acceptable then you simply need to separate them by a forward slash. You can even adjust it to accept one answer or require all in the Learn, Test, SPell, and Gravity sections. Improved App: The iOS app has been completely redesigned with an improved home feed and now you can manage classes from your mobile device as well. GimKit Link: One of my favorite new game-based learning tools is GimKit that allows to students to purchase power-ups as they answer questions. That means even students who have fallen behind don’t have to feel like they’re out of the running. It works even better with a Quizlet account as you can link your Quizlet content directly to your games.